These Baked Instant Pot Chicken and Cheese Taquitos are a total crowd pleaser! These chicken taquitos are freezer friendly and easy to prepare for any weeknight dinner! Your family will LOVE them! Looking for something tasty to make for dinner that is fast, uses your awesome Instant Pot and is something your whole family will enjoy? 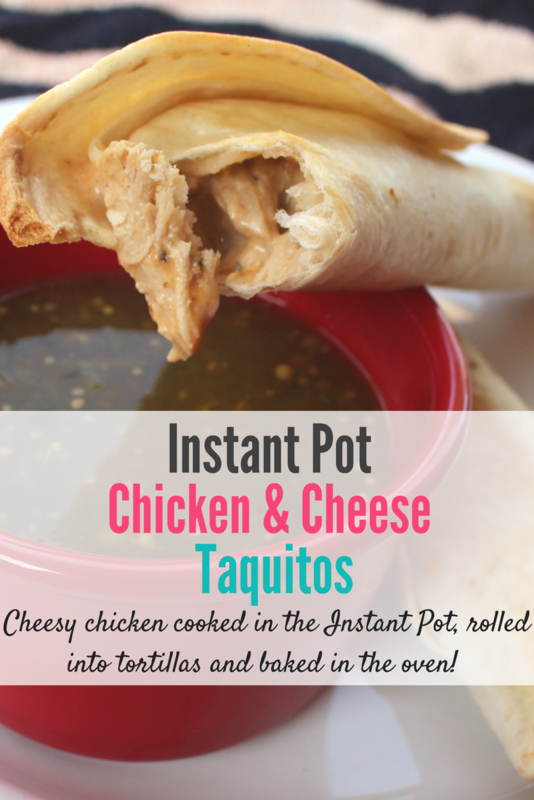 These Baked Instant Pot Chicken and Cheese Taquitos are a total crowd pleaser! In the picture, you’ll notice I used rather large tortillas. I recommend using the smaller fajita size/soft taco sized tortillas. These were very filling! Serve with sour cream, guacamole, salsa (mmm, serve it with this awesome stuff! ), queso, etc. The possibilities are endless! Place chicken, taco seasoning, cream cheese and water in your instant pot. Cook under pressure on the “poultry” setting. Allow to naturally release. Take chicken out and shred it (I use my KitchenAid to shred chicken!!) and then add the shredded cheddar and stir. Next take a tortilla and put about 1/4 cup of the meat mixture down the center. Roll it tightly and place it seam side down in a baking dish. Repeat for the other tortillas. Spray with non stick spray OR brush lightly with olive oil. Bake for 8-12 minutes until crispy. Cook under pressure on the "poultry" setting. Allow to naturally release. Next take a tortilla and put about ¼ cup of the meat mixture down the center. Roll it tightly and place it seam side down in a baking dish. Repeat for the other tortillas.